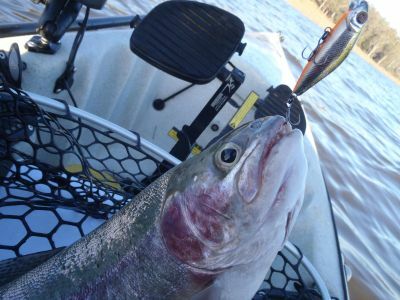 For the avid fly fisherman, Four Springs Lake is a pretty good option in the warm weather. Close to Launceston and super convenient for that after work trip. 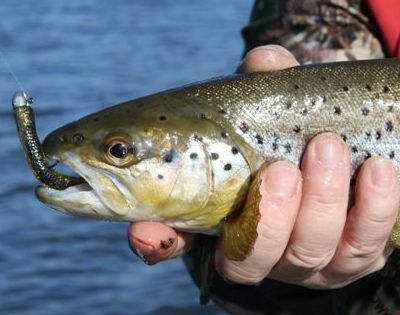 But ask any lure fisherman what Four Springs fishes like in the summer and you will probably get a reply consisting of something like “…the weed is really bad – it’s not worth the trip.” I think the first part of this answer is totally correct. It is a well-known fact that underwater weed growth increases with warmer water temperatures. 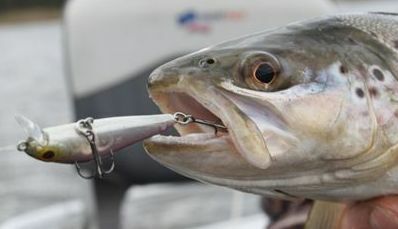 Casting lures becomes difficult and trolling is near impossible. Weed every cast – definitely not anyone’s cup of tea. I took Bailey out to Four Springs Lake after school today as he hasn't wet a line for a while. He fished up the eastern shore north of the ramp and got a small rainbow in the first ten minutes. 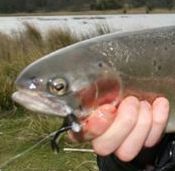 He released it not long after that he landed a nice fat rainbow around the 3lb mark. He had a few hits and boils as well, but not hooking up - then disaster struck - his bail arm on his reel snapped. He snapped too - would have got a few more I reckon. 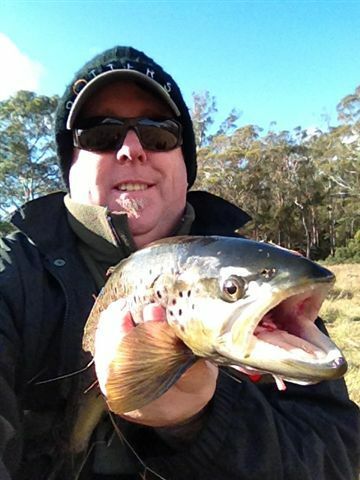 I met my friend John and his junior angler @ Foursey today, keen to break my recent “Trout drought”. By lunchtime Lachlan had landed one, John had dropped one, and I’d had just one hit but no hookup. My companions had to leave early afternoon, but I stayed on. I had a look at Four Springs with Bailey today after school. It was only a small session, as we didnt have a great deal of time to fish. We did got a couple hours in though. We managed a few nice browns caught on black and golds and Dales Yep KW Galaxia,dropped a few and missed a few others, but that's fishing, you dont catch them all. I had a couple of hours at Four Springs in the rain. I must be getting silly in my old age, or just love my fishing. I managed to catch a couple, dropped a few and had a couple more hits. There was about eight boats on the water and about the same amount fishing from the shore, so I wasn't the only silly one! I'm now back home sitting by the heater to get warm again. I decided to have a day off work with Bailey and go fishing. The mad Hungarian George Papp also came along,...he didn't want to work either . So we left home around 9.30 am,got on the water at 10.30 am,dropped George off on the western shore,as he wanted to fly fish that shore line and Bailey and I drifted around the southern bay. Put in a couple of hours in good conditions today , (unlike yesterday), anyway, had a good day wading the car park shore for a couple of brownies. Caught both mine on trusty black and gold t.tails . I returned to Four Springs again today for round 2. The curse left today thanks to Vic he told me to use a spin rod to start the day off and when I had caught a fish then I could use the fly rod. It worked after casting my arm off landed a nice 3 1/2 LB. brown. I then reverted to the fly rod with the orange bead headed nymph and hooked up and all hell broke loose. 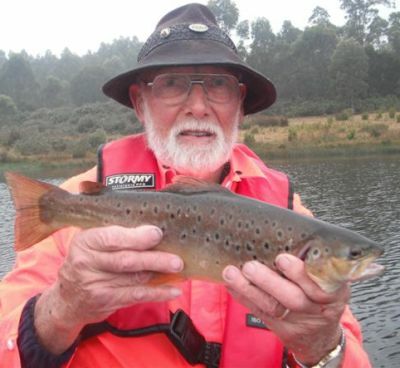 Vic was running round the boat pulling drogues in and moving rods lifting motors while trying to reach the net. 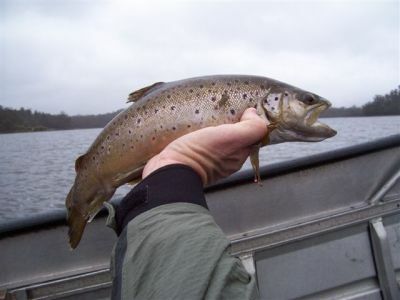 a smaller brown. He also dropped 3 good fish. We have decided to fish it again tomorrow. that the season is closing as I would like to catch a couple of fish. We headed off to Foursey's this morning with Johnny Dekkers, leaving home at 5am. Upon arrival, it started to rain and John suddenly realised he had forgot to bring a coat, being the stubborn old goat he is, he was determined to fish anyway. Luckily we managed to hunt up a red one from the boat, hence the bright colour in the picture.